You can access Censys datasets in BigQuery through a web UI, command-line tool, and REST API as well as through Dataproc (Google's Spark and Hadoop offering). There are also a variety of third-party tools—like Looker and Tableau—that you can use to interact with Censys BigQuery data. Popular Websites. We provide a daily snapshot of the current state of the Alexa Top Million Domains collection. BigQuery's SQL dialect is compliant with the SQL 2011 standard and you can query tables once you have added the Censys datasets [more information]. You need to use Standard SQL to query the Censys datasets. Unfortunately, Google BigQuery may default to Legacy SQL and the option to change your query to Standard SQL is hidden. Confirm your query is using Standard SQL by opening the query editor and selecting the "More" button. In the drop-down menu, select "Query Settings" to open a window similar to the one below. Confirm that any references to Legacy SQL are unselected. For more information on constructing SQL statements, check out the BigQuery SQL Reference. Censys datasets are extremely wide (often containing thousands of columns). This means that seemingly simple queries (e.g., finding a single record about a host: select * from ipv4_public.current where ip = '8.8.8.8' ) will process several terabytes of data. This can be costly ($5-10 for the single query) if you're not careful. You can easily reduce these costs by only selecting the columns you need and by combining small queries into a single large query. Standard SQL Only. BigQuery does not allow mixing standard and legacy SQL. This means that Censys views can only be queried using Standard SQL. No Direct Export Jobs. The results of queries against Censys views cannot be directly exported to a file on Google Cloud Storage. If you want to export results, you'll need to save the results of your query to a temporary table and export that to an external file. No Wildcard Queries. You cannot reference a view in a wildcard table query. Instead, you'll need to explicitly reference the tables you want to query. If these limitations are causing significant problems, please reach out to our team at support@censys.io. Service Account. 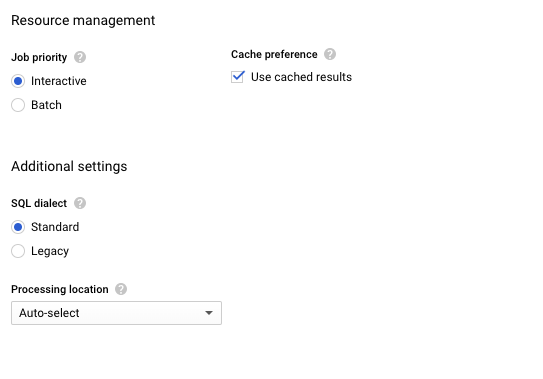 The service accounts you create in your Google Cloud Project will not automatically be granted access to the Censys BigQuery datasets (access is only granted to your user account and this does not propagate to the cloud project). If you'd like to have a service account added, please reach out to us at support@censys.io.